You've probably seen me post about and mention our doggie Jefferson before, but just in case you haven't, he is a medium sized golden doodle and basically he is our child! We want to have kids one day but not for a bit still, so in the meantime hubby and I got a dog and he has, strangely enough, made us feel more like a family. Since Jefferson is basically our child for the moment we spend a lot of time talking about him and and worrying about his well being. We care a lot but we are not "crazy overprotective parents" or dog parent extremists. For example: he's still a dog and can sleep in his crate while we are at work and does not need to go to doggy day care. He also is a dog so hence it is ok if we just feed him dog food; no way am I going to cook him up his own meal of chicken and rice like I've heard of some people doing before!! Even though I'm fine with feeding him dog food, I'm still careful with what I'm picking. When we transitioned Jefferson from puppy food to adult food, Jefferson started scratching at his coat non-stop. Something in the new dog food was having some very adverse side affects on our baby! Ever since then I've been much more careful with the brands of food I buy. 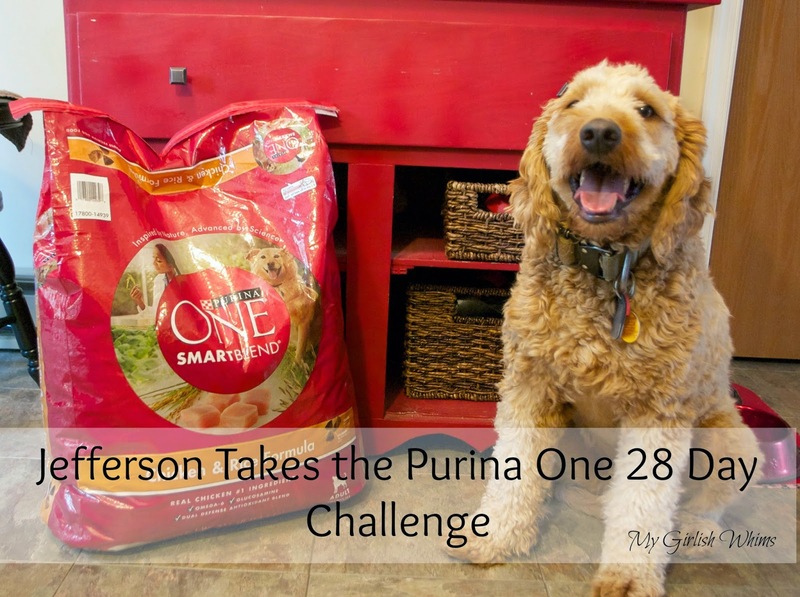 When I was given the opportunity to start Jefferson on the Purina One 28 Day challenge I was interested because I know Purina One is a reputable brand but just never happened to be one of the kinds I've brought home since starting Jefferson on adult food. So, I went out to Walmart (also available at Target, Petsmart and more) and lugged a big bad home and started Jefferson on the challenge to see if I could notice anything different about him after 28 days. Jefferson was pretty excited to start too. 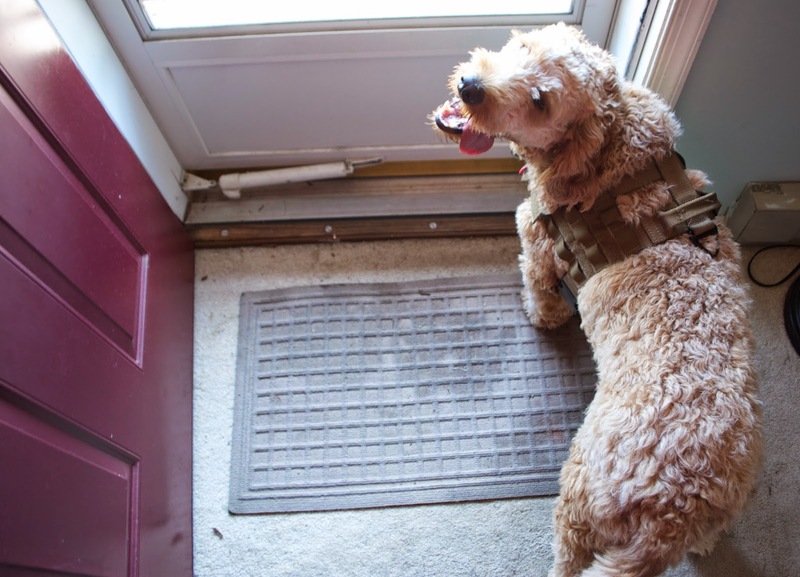 Granted, as a dog he gets excited about MOST things including a nice dirty sock to chew on or someone walking past the window... but still haha. He's giving me a look in this picture because I told him to "wait" to eat. He can only follow two commands: "sit" and "wait" but they are pretty useful ones know! After I told him "OK" Jefferson started to chow down. Really chow down! That was the first thing I noticed in the beginning of the challenge. Jefferson really liked how the food tastes. We always feed him twice a day: once in the morning and once in the evening around our meal times. He normally would always wait until after we finished eating or until he got tired of following us around until he would start on his dinner. Not anymore! As soon as that food bowl goes down Jefferson starts chomping. 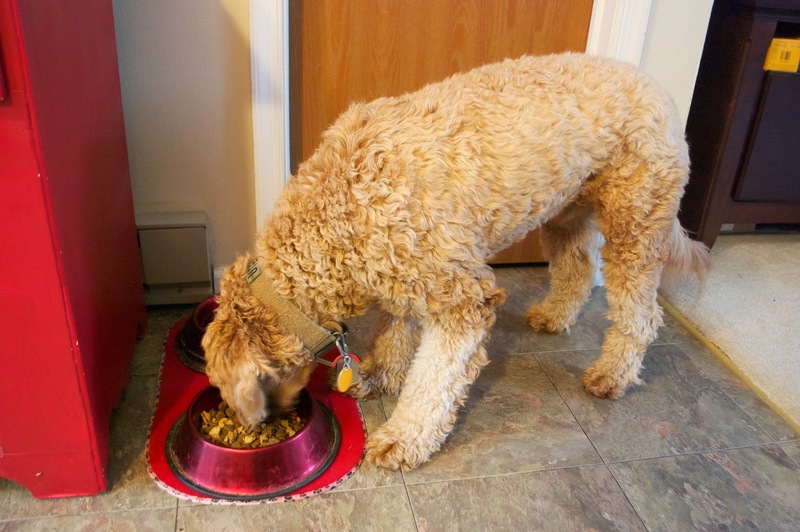 I think he likes it more than his last dog food because in addition to the traditional brown hard kibble bits, there are softer flakier pieces that almost resemble chicken that gives some variety to the food! As the challenge progressed I also noticed a change in Jefferson's energy level. He's still young so he already is energetic, but I'm pretty sure this little guy has gained a good bit of stamina! I've been taking him out jogging with me about twice every week and he ALWAYS is running right beside or in front of me, tail wagging and tongue flopping out the side of his mouth. As soon as he gets his harness on he KNOWS what's coming! He already has his tongue hanging out the side of his mouth in anticipation in this picture! One Saturday both Shawn and I took him for two separate runs. Shawn took him for a shorter but faster run in the early morning (I workout everyday but jogging is NOT my strong suit. I need to take some walking breaks!!!) and then I took him for a longer jog/walk in the early afternoon. I was a little worried if he would be able to keep up with me at the end, but no worry was needed. I think Jefferson could have kept going wayyy after my lungs were ready to call it quits! Do you have a dog that is a big part of your family?? 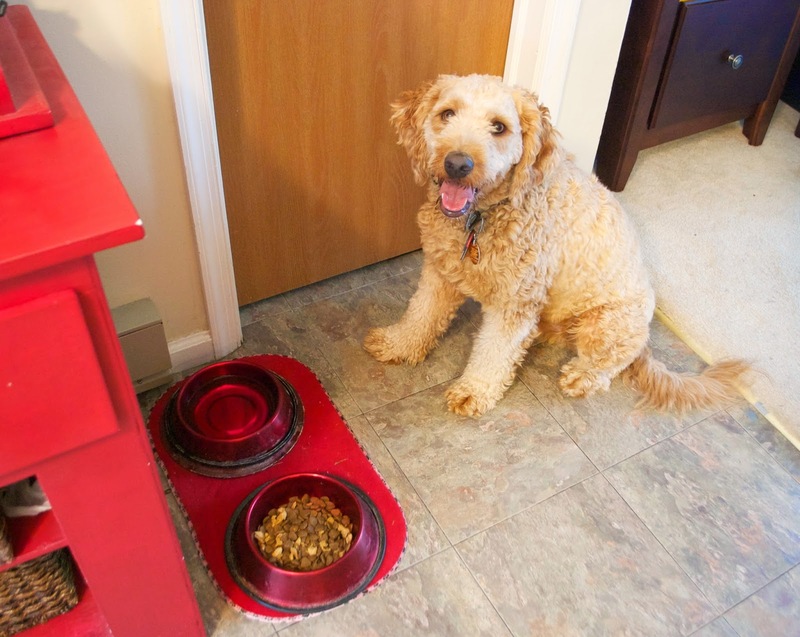 Take the 28 days challenge with Purina One and see what will change with your furry friend! 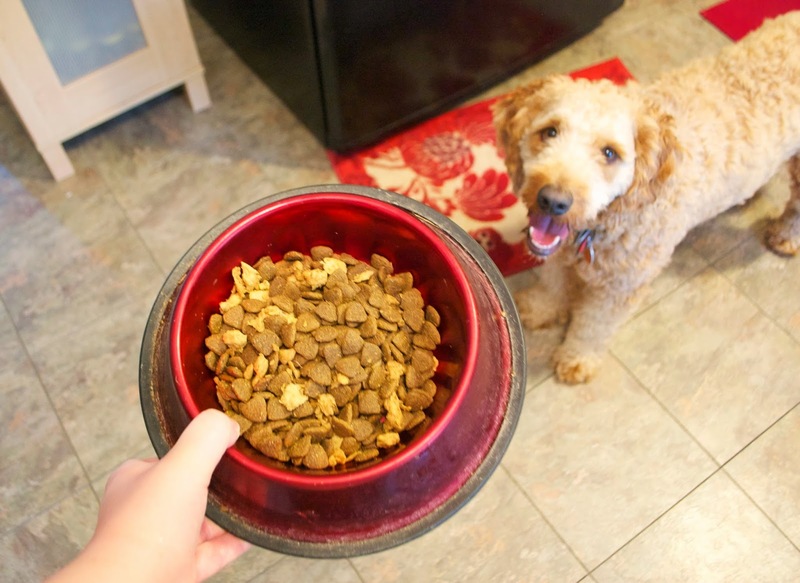 Sign up with Purina One and get a $3 couple off your first bag of dog food. Check out this Purina food at www.DogFoodAdvisor.com and see what kind of a rating it gets. We only feed foods that have four or five stars for good reasons.